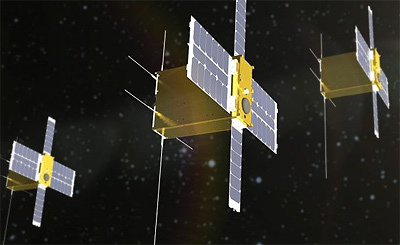 SAMSON (Space Autonomous Mission for Swarming and Geolocation with Nanosatellites) is an experimental mission of Technion, supported by the Israeli space industries, to demonstrate long term formation flight. It is built to the 6U CubeSat standard. Determine the position of a cooperative terrestrial emitter based on time difference of arrival (TDOA) and/or frequency difference of arrival (FDOA). Additional payloads may include a micro Pulsed Plasma Thruster (PPT) and a new space processor. The configuration of each satellite will be a 6U CubeSat. The mission is planned to be launched in 2016. The three satellites will be launched together with the same semimajor axis, eccentricity and inclination and separated in orbit to form a cluster with relative distances ranging from 100 m for the closest two, to 250 km for the farthest two. One satellite will be designated as "leader", and the others would serve as "followers". The followers will perform relative orbital element corrections to satisfy the relative distance constraints. The satellites will have the ability to switch roles if commanded from ground. The SAMSON satellites were originally planned to be launched on an Indian PSLV rocket, but were later transferred to a Russian Soyuz-2-1a Fregat-M launch in late 2018. SAMSON missed the ready date for this launch.